Pictures & Images of the Medieval Gothic ruins of Fountains Abbey & Studley Royal Park Water Gardens. Founded in 1132, the abbey operated for over 400 years until it was closed by Henry VIII during the Dissolution of the Monasteries. The Abbey is part of It is one of the largest and best preserved ruined Cistercian monasteries in England and was the second Cistercian monastery to be built after Rievaulx Abbey just 20 (32km) or so miles away. After its closure like all monasteries in England it was abandoned and became a ruin. In 1718 John Aislabie the owner of the Studley Estate & Chancellor of the Exchequer decided to build a water Garden in his park. The style of the day was for picturesque landscaping and the ruins of Fountains Abbey were incorporated into the design at the end of a sweeping curved lake that follows a narrow wooded valley. This has created the famous vista of Fountains Abbey making Studley Royal one of the best surviving examples of a Georgian water garden in England. Studley Royal Park including the ruins of Fountains Abbey owes its originality and striking beauty to the fact that a humanised landscape was created around the largest medieval ruins in the United Kingdom. The use of these features, combined with the planning of the water garden itself, is a true masterpiece of human creative genius that influenced the rest of Europe. 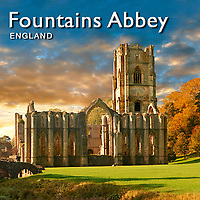 Studley Royal & Fountains Abbey are a UNESCO World Heritage Site. Buy as high resolution stock royalty free images of travel images to download on line or buy as photo art prints.